Renewable energy is economically and environmentally attractive but variable by nature. Mining’s need for power is expensive, continuous and rising. Improved energy efficiency can narrow the gap between RE supply and production demand. 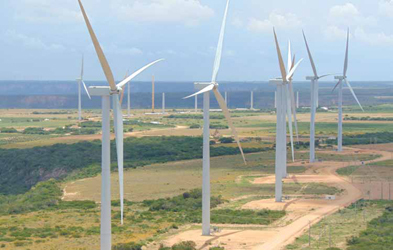 from the Folha Larga Sul wind farm, located in Campo Formoso, Bahia state. Mining is a power-hungry business. It takes massive amounts of energy to excavate and process ore into a marketable mineral commodity. Although it’s hard to compare operating costs between mines located in different districts or regions, it’s commonly estimated that a typical site may incur energy costs that represent anywhere from 10% to 30% of overall operating costs. In some mineral-rich countries, the mining industry is by far the largest user of electrical power, accounting for more than 20% of national consumption in Chile and more than 50% in Zambia, for example. Columbia University’s Center on Sustainable Investment (CCSI) predicts that with rising mineral demand and falling ore grades, mining’s energy demand will increase 36% by 2035. The sheer amount of electricity required for modern mining can be astonishing when broken down into everyday examples. For instance, 120-ton-payload electric rope shovels can consume as much electricity in one day as an average U.S. household uses in a year. Power-infrastructure costs can be equally daunting. First Quantum Minerals reportedly spent approximately $230 million to bring power from the Zambian national grid to its $2.1 billion Sentinel mine and the nearby town of Kalumbila. Although access to energy is necessary for almost any type of mining operation, industry surveys indicate it hasn’t always been at the top of the list of general industry concerns. For example, in 2008 — peak year of the mining supercycle — the multinational professional services company Ernst & Young (EY) ranked “access to energy” as the ninth out of 10th top business risks facing the mining industry, and it stayed in ninth place until as recently as the 2017-2018 report. In the 2019-2020 report, however, a new concern titled “energy mix” appeared at sixth in the list of risks. • Social and reputational implications of choosing energy sources. • Viability of energy sources, particularly in remote locations. • Management of the availability of energy over the entire mine life and the counteracting of fuel price volatility. It fits a pattern. In the current business environment, traditional methods for accomplishing a number of critical mining functions such as communications, data collection and asset management are increasingly regarded as expensive, inefficient and outdated — and conventional energy sourcing and usage is ripe for inclusion in this category. However, the mining industry seldom benefits from one-size-fits-all solutions, due to the differing characteristics and needs of individual operations. Within a single company, whether the label is energy mix, energy efficiency or energy optimization, it may be only one of several issues competing for money and management attention. But, at whatever level energy efficiency ranks in an organization’s hierarchy of operational concerns, it can broken into two simpler issues: how energy is sourced and how it’s consumed. In this article, E&MJ provides a quick scan of industry developments that address both of these areas, highlighting new alliances, technologies and equipment designed to solve some energy-related challenges. • Not utilizing third parties to develop, fund and deliver RE assets. • Renewables seen as “non-core,” with significant internal resource/opportunity cost. • Limited over-arching divisional or regional energy strategy. • Lack of clear strategic view or response to approaches by renewable energy developers. However, a press release distributed recently by Voltalia, a French power provider specializing in RE sources, and THEnergy, a boutique consultancy focusing on microgrids/mini-grids and offgrid RE, points to positive changes and expanded opportunities in the industry. Specifically, this is in regards to energy supply in remote regions or wherever the power grid is incomplete, unreliable or experiencing stress from growing demand, such as Africa. According to Thomas Hillig, managing director of THEnergy, large IPPs take advantage of economies of scale on components for solar and wind power plants not only for remote mining projects, but also for much bigger grid-connected plants. One of the most recent example of mine operators turning to transactions with independent power providers is Resolute Mining’s signing of a joint development agreement (JDA) with Ignite Energy Projects Pty Ltd., a financier, developer and operator of power projects in Africa, for the development of a new 40-megawatt (MW) independent solar hybrid power plant at the company’s Syama gold mine in Mali. shifts to cost optimization, THEnergy-Voltalia, February 2019. The Syama solar hybrid power plant will combine solar, battery and heavy fuel oil (HFO) technologies. The innovative project is expected to be the world’s largest off-grid, fully integrated hybrid power plant for a stand-alone mining operation. The new power plant will replace the existing historic 28-MW diesel-fired power station at Syama and is expected to be fully operational by the end of 2020. The project will be funded and constructed under an IPP model whereby Ignite Energy, under the terms of an exclusive power purchase agreement, will be responsible for the design, construction, ownership, funding, and operation of the new power facility on an exclusive basis and will supply power to Resolute on a guaranteed basis subject to a maximum tariff over a term of between 12 and 20 years. Managing Director and CEO John Welborn said the Syama solar hybrid power plant will deliver long-term electricity cost savings for the mine of up to 40% while reducing carbon emissions and providing tangible benefits to local Mali communities. “The project is a key component of delivering the expected sub-US$750 per ounce all-in-sustaining-cost for the Syama underground gold mine.” The company said the plant will comprise an advanced combination of modern solar photovoltaic generation (Solar PV), HFO-based generation, and a battery- based energy management system. HFO fuel costs are expected to be up to 50% lower than diesel, with larger modern generating units substantially more efficient than Resolute’s current engines, which date back to when the Syama power station was originally established by BHP in the 1980s, featuring a fleet of diesel generators, which have progressively expanded to meet operational requirements. The current cost to generate power at Syama ranges from $0.20/kWh to $0.24/kWh depending on prevailing diesel fuel prices. • Energy Attribute Credits – The mining company purchases credits produced by RE power plants. • Grid-connected sourcing green energy – The mining company buys green premium products or pays green tariffs to a utility. • Industrial Pooling – Several companies commit to buying electricity from an IPP, making a RE project viable. • Self-generation – The RE power project is built and owned by the mining company. 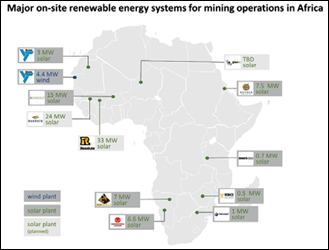 For example, as part of a cost-reduction program and drive to manage its carbon footprint, Barrick Gold’s Loulo operation in Mali plans to install a 24- MW off-grid solar hybrid plant to support its existing 63-MW thermal power station. The company said the solar plant has the potential of saving 10 million liters of fuel a year while reducing Loulo’s annual carbon emissions by 42,000 metric tons (mt). Barrick said the RE project is part of its strategy of moving away from thermal power in Africa, where lack of infrastructure means that many mines need to rely on self-generated diesel energy, making this their largest cost item. According to a solar feasibility study, the photovoltaic plant is expected to replace 50,000 MWh/y of thermal generation. The introduction of the solar component will cut the complex’s energy cost by around 2 cents/kWh. Construction of the project, which Barrick said meets its investment criteria of 20% IRR, will start later this year, and it is scheduled for commissioning in late 2020. The plant will use the latest weather prediction models, which will enable the power management system to switch between thermal and solar without compromising the microgrid. Meanwhile, Gold Fields’ Granny Smith gold mine is planning to install a microgrid powered by more than 20,000 solar panels and backed up by a 2-MW /1-MWh battery system. The mining company contracted mobile and modular power company Aggreko to design, build and operate the 8-MW solar power generation and battery systems at the mine, located east of Laverton in Western Australia. Gold Fields Executive Vice President Australasia Stuart Mathews said, “We expect the renewable power microgrid will be up and running at Granny Smith by Q4 2019 and it will be a welcome addition to our suite of on-site energy solutions across other operations which will enable us to reduce our carbon footprint.” Construction of the renewable energy system is to begin in May and, when completed, will be one of the world’s largest hybrid off-grid microgrids and integrated with Aggreko’s existing 24.2-MW natural gas generation. Aggreko AusPac Managing Director George Whyte said the solar, thermal and battery storage assets will be integrated and managed by Aggreko’s control software platform. “The solar-plus-battery system is projected to reduce fuel consumption by 10–13% and produce about 18 GWh of clean energy per year,” Whyte said. While the solar PV will reduce the need to run thermal generators, the battery plant will provide essential services such as spinning reserve displacement, PV ramp rate control and transient voltage/ frequency support. As RE technologies and systems proliferate, power systems will need to adjust accordingly to better accommodate inputs from variable renewable energy (VRE) sources like solar and wind plants by improving system flexibility, according to a report issued by REN21, a global RE policy network. However, renewables technology is evolving to improve ease of integration, and state-of-the-art solar PV and wind energy generators can provide a variety of relevant system services to stabilize the power grid, said the organization. In countries that may have hundreds of remote communities and a large number of off-grid mining operations, the intermittent nature and power fluctuations of RE sources, combined with low inertia of small isolated power systems, give rise to power quality and stability issues that require advanced dynamic load-generation balance control. In addition, with multiple generation assets on a system, power dispatching becomes complicated. As NRCan, Canada’s federal natural resources agency pointed out, remote and isolated microgrids require a resilient real-time control system. Recognizing the need, consulting engineering company Hatch was awarded $2.22 million to develop a commercially viable controller that facilitates the integration of renewable power and energy storage into remote microgrids while maximizing performance and maintaining system stability. Hatch, employing research performed at the University of Waterloo, designed and developed the Hatch Microgrid (HµGrid), described as a utility-grade controller. HµGrid incorporates modules for power system measurement, dynamic power shaping, supervisory control, optimal economic dispatch, as well as energy storage, generator limit, smart load and output management. When fluctuations occur in a power grid, the first few seconds determine whether a blackout will occur. Last August, Siemens introduced what it calls “the missing link in the energy transition” — its SVC Plus Frequency Stabilizer (FS). Siemens claims to be the world’s first supplier to combine reactive power compensation capability with the use of so-called supercapacitors. Supercapacitors’ charging mode is electrostatic, which means that electrons are moved instead of molecules. As a result, they are charged and discharged much faster than storage batteries. According to the company, SVC Plus FS can feed the reactive power needed for stable grid operation in less than 50 milliseconds. At the same time, up to 200 MW of electric power stored in the supercapacitors can be transferred to the grid at full load. As a result, the voltage and frequency, and thus also the grid, remain stable. This automatic procedure is triggered whenever the voltage or frequency exceeds or drops below certain limits. This capability, said the company, is particularly important in power grids that are exposed to volatile infeeds. For example, from increasingly more distributed and RE sources. Siemens buys the supercapacitors from Maxwell Technologies, and is responsible for managing the static var capacitors and supercapacitors, connecting to the grid, and integrating the system. It said SVC Plus FS takes up approximately two-thirds less space compared with a battery storage solution at reference power of 50 MW. And, while it’s unlikely that any manmade mechanism will be capable of taming the variability of wind and solar sources, their predictability may be a different matter, thanks to advances in Artificial Intelligence (AI) technology. Deepmind, an AI research company owned by Alphabet Inc., parent company of Google, recently reported a successful effort to apply machine learning to predict wind-farm power output more than a day in advance. Sims Witherspoon, a program manager at Deepmind, and Will Fadrhonc, Carbon Free Energy program lead at Google, wrote in a February blog post that a program that began last year has applied machine learning algorithms to 700 MW of wind power capacity in the central United States. These wind farms — part of Google’s global array of RE projects — collectively generate as much electricity as is needed by a medium-sized city. “Using a neural network trained on widely available weather forecasts and historical turbine data, we configured the DeepMind system to predict wind power output 36 hours ahead of actual generation,” they said. “Based on these predictions, our model recommends how to make optimal hourly delivery commitments to the power grid a full day in advance. This is important because energy sources that can be scheduled (i.e., can deliver a set amount at a set time) are often more valuable to the grid. “Although we continue to refine our algorithm, our use of machine learning across our wind farms has produced positive results. To date, machine learning has boosted the value of our wind energy by roughly 20%, compared to the baseline scenario of no time-based commitments to the grid.” The authors didn’t explain what the “value” increase of the wind energy was based upon, but it’s likely that a large portion of this figure could be attributed to operational cost savings. Regardless of the source, how electricity is used on-site is critical in achieving improved energy efficiency. Comminution consumes an estimated 50% or more of electricity at most operations, with motors, drives and pumps using the lion’s share of that amount. For that reason, it pays to work closely with motor and drive equipment suppliers that can offer specific models, systems and advice to optimize energy usage — particularly about how new technology, combined with proper component selection and attentive maintenance, can make a difference energy- wise. Here are two examples: For customers seeking overall improvements in plant performance, including energy efficiency, ABB’s announcement of a contract award from KAZ Minerals last year provides a glimpse of available wide-scope, integrated enhancements. ABB said it will deliver a comprehensive process and power solution that will double the capacity of KAZ Minerals’ sulphide ore processing plant in Aktogay, Kazakhstan. According to ABB, this project is the third major order from the customer and will reuse the engineering and solution configuration from the company’s two other production lines in the area. KAZ Minerals is the largest copper producer in Kazakhstan. ABB will provide its ABB Ability MineOptimize integrated process and power control solution, which includes all process control and electrification equipment and infrastructure for the plant. ABB Ability MineOptimize is a framework that encompasses engineering, systems, applications and services to help mining customers achieve the most efficient design, build and operation of any open-pit, underground, mineral processing or refining facility. ABB’s scope of supply for this project includes its ABB Ability System 800xA digital automation system, as well as three gearless mill drive systems, and a high-pressure grinding roll to handle the increased amount of ore that will be processed in this expansion. The delivery also includes distribution transformers and substations, motor control centers, medium and low voltage drives, mineral processing specific applications, and other automation and electrical equipment. Furthermore, ABB will provide project engineering, installation and commissioning services, and ongoing remote monitoring and diagnostic services. ABB said its delivery will provide numerous operational and safety benefits for this project. It will monitor, control and manage all aspects of production, access critical information from system devices and provide detailed data analytics to determine process efficiency and identify opportunities for improvement. It will also monitor and manage energy distribution and consumption at this and other KAZ Minerals sites. Also available are power monitoring software solutions focused on specific equipment and systems. For example, ABB’s Ability Smart Sensor package has been integrated into a Swiss pump manufacturer’s product line, allowing users to monitor unit energy consumption and apply predictive maintenance to avoid unscheduled downtime. In the conveyor market, Voith says its BeltGenius ERIC allows mine operators to see at a glance the efficiency of their conveyor belt systems at any time. The system continuously receives relevant performance data from the conveyor belt system, including belt speed, belt tension, effective motor power for all drive motors, and temperature. These parameters are then transmitted to a server at Voith. The server contains a digital twin of the system, in which all relevant information about the conveyor are stored, such as belt length, belt width, the diameter of the carrying rollers, drive pulleys, return pulleys, the configuration of the transfer stations, the topography, and the trough angles. Using this information, ERIC determines a normalized efficiency value referenced to the energy consumption for horizontal material transport, known as the Energy Performance Indicator (EnPI). This indicator allows the operator to quickly assess how efficiently the particular belt conveyor is currently operating. The data are visualized on the client’s individualized user interface, in the form of an online dashboard. Voith says this normalization makes it possible for mine operators to easily compare all existing systems in terms of their energy performance. The digital twin compares the installed power to the energy actually being used. This, according to Voith, allows the operator to identify power reserves and put existing belt conveyor system capacity to optimum use without jeopardizing the safety of the system. Voith also offers the option of equipping individual belt segments with RFID chips. With this option, less-efficient belts and system sections are easier to identify through interaction between the digital twin and the RFID, according to the company.